Their assignments were straightforward: Eileen, posing as a maid in a manor house, was observing evacuated children in 1940. Polly, after observing FANYs during the V1 and V2 attacks in 1945, was going to observe civilians in London during the Blitz in 1940. Michael, whose research focus was ordinary-people-turned-heroes, was going to Pearl Harbor and a handful of other important moments in American and British history, including Dunkirk. But their supervisor, Mr. Dunworthy, has been rescheduling drops, sometimes even cancelling assignments entirely. Historians can’t alter events, they’ve all been told. The continuum wouldn’t allow it. The drop simply wouldn’t open, or there would be enough temporal or locational slippage to prevent the time-travelling historian from interfering where they weren’t supposed to. But what happens when it looks like a historian does alter events — through influencing someone they meet, or by saving a life? And what happens when they can’t get home? Blackout and All Clear by Connie Willis is a single story split into two volumes, chronicling the lives of three historians from 2060 and their experiences in 1940’s Britain. Willis again demonstrates her ability to translate an impressive amount of research to bring the daily experiences of ordinary people in the past to life, and then succeeds in doing so through the quality of her fiction. In Blackout/All Clear, Willis weaves time travel, the Blitz, Dunkirk, the evacuation of children, the fire-watch of St Paul’s Cathedral, the V1 and V2 attacks, Bletchley Park, Fortitude South, Agatha Christie, Shakespeare, and more to create a tapestry of unsung heroes, each doing their bit to win the war. It is difficult to summarize the book too much without giving anything away, because nearly everything is important (even if you don’t know it yet), so instead I will say that Willis’s writing improves over the course of her Oxford Historians series. The Doomsday Book is good, but To Say Nothing of the Dog is better, and Blackout/All Clear are even better in terms of the tightness of the prose, the presentation of different timelines or storylines, and of characterization. Early in the morning, the sun rose, and shortly after, so did the town. Walking in at 6AM, three hours earlier than normal, the town was waking when it would otherwise be asleep. Queen’s Gardens was still quiet; South Street, a little less so. By the time I made it to North Street all was hustle and bustle as I and a few hundred others were ushered into St Salvators Quad. The Olympic Torch was coming. Preceded by a relay race run by school children from the different primary schools in town, by a speech from the University Vice-Chancellor and town Provost, the torch that has been touring Great Britain came into view. All watched as it was lit with fire from a Fife miner’s lamp and cheered when it was held aloft. The torchbearer then ran around the Quad and left through the chapel archway to the peal of St Salvators’ bells — ringing a peal specially composed for the occasion. The torch then ran up North Street and down South Street and on to the rest of Fife. I had a ticket to get into the Quad for the lighting ceremony thanks to my job at the museum. I’m glad I went — it was a chance to participate ever so slightly in a bit of history. 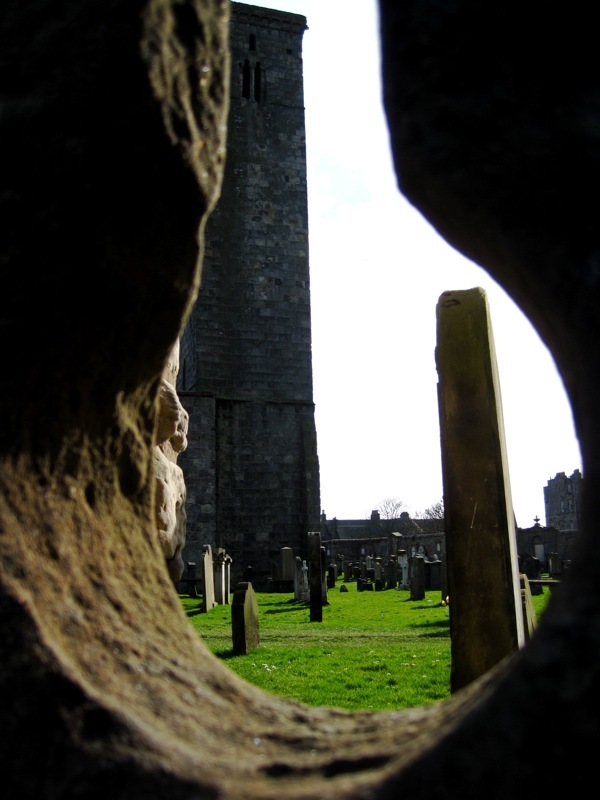 Peeking through archery windows to see green grass, bright sky, and the tallest building in town — St Rule’s tower, built in the twelfth century. In 1939, Liesel Meminger is taken to live with a foster family in Molching, a suburb of Munich. She never knew her father; her brother died on the way; her mother is too poor to care for her. Her new family isn’t much better off. She goes to school and plays football on the street with the neighbourhood boys. Far away, it seems, the world is at war. But over the next few months and years the war begins to be felt in Molching, in the basement of 33 Himmel Street, where amidst the discovery of reading and words and the music of the accordion the Hubermanns and Liesel are hiding a terrible secret. To be honest, I wasn’t expecting to like The Book Thief by Markus Zusak. And in all honestly, although the first few pages really gripped me, I was getting rather bored until page 170 or so. But then Things started happening and it kept my attention until the very end and for a while afterward. (Sometimes I can start another book the next day after finishing one; but with others I have to wait a day or so before I’m ready to move on.) At times I found the narration somewhat tiresome — the novel is narrated by Death, who sometimes tells you events out of order — but by the end I appreciated the way and the order in which I as the reader was exposed to the information. The ending was powerful; I wish I knew more of what happened next. One thing I found particularly interesting was that this wasn’t your typical WWII novel. This wasn’t set in a camp, it wasn’t about resistance fighters, it wasn’t about people in occupied territories. While I was reading this novel, I realised that I had never really took the time to think about what the war was like in Germany. Being an American, living in Britain, the primary narrative I’ve been exposed to has been the Anglo-American one. 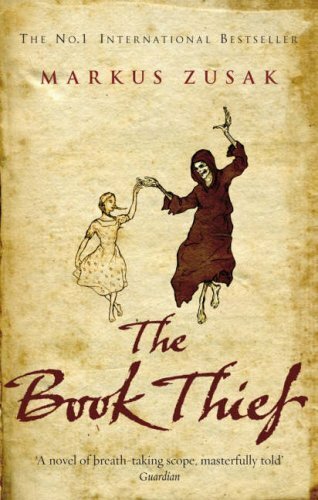 What I appreciated about The Book Thief was that it depicted a microcosm of, well, ‘normal’, realistic people. Families trying to get by. Regular people not all that concerned with politics, varying in ignorance or knowledge, varying also in their opinions. I was struck by the scenes in the bomb shelter: swap the names of the targets and the attackers and it would have found its reflection in the suburbs of London. In some ways I found this uncomfortable. In the same ways, I appreciated being challenged. If you can make it through the first 170 pages and bear the company of Death, you just might like this book. To take a break from writing a conference paper (of which I wrote half of this morning), I decided to scroll through the huge family ancestry chart my brother sent me ages ago. It’s fun to look at all of the names and dates and guessing what was going on in the world when various ancestors lived. I knew we had some American Revolutionaries in our family, but I didn’t know that some ancestors immigrated to the New World as early as the 1630s. We might even have had some relatives at the ‘First Thanksgiving’! I am back to writing about Thomas of Erceldoune, who is not, alas, in my family history, even if there is archival evidence of his actual existence. Human nature will not flourish, any more than a potato, if it be planted and replanted, for too long a series of generations, in the same worn-out soil. My children have had other birthplaces, and, so far as their fortunes may be within my control, shall strike their roots into unaccustomed earth. The above is the epigraph to Unaccustomed Earth by Jhumpa Lahiri, one of two short-story collections written by her. (The first is Interpreter of Maladies, which won the Pulitzer Prize and is, of course, brilliant. There is a nice review at the American Literary Review Blog about it.) Some of you may be familiar with The Namesake, her novel that was made into a film. Each of her stories is a microcosm that offers a glimpse into the lives of those who move from one side of the world to another, from one world to a different one, different in language, colors, culture, and of their children. Most of the stories deal with Indians who move to England or to the U.S., but they also tell of the pilgrimages back to India and the tension of being caught between two worlds. 1. A person who migrates to another country, usually for permanent residence. 1. One who has taken up residence in a foreign country. And so I make this post on the 4th of July. This was not planned, but it is fitting. I consider myself an ex-pat because it is easier to love my country from a distance — I love its founding, the promise that it held, that it still holds to some extent today. But sometime over the past two hundred years, the eyes of the people turned inward; the American pioneering spirit became individualistic to the point of selfishness, and I, who had seen the outside world, first through books and imagination and then with my own two eyes, could no longer bear to be caged. My American readers, I hope you have a good 4th of July. I also hope that you remember to read the Declaration of Independence. This is a day to enjoy with family and friends, with cook-outs and fireworks and games, but it is also a day to remember the spirit and the words that first created the United States of America. And on a completely unrelated note, for the curious: 6066, but I haven’t yet written today. My latest job in Special Collections included ‘tidying up’ the pre-1890 stacks. Thankless, and tedious, but I actually didn’t mind much because I saw it as an opportunity to acquaint myself with the stacks. Starting first with philosophy and religion in the A’s, I had fun looking at all the titles and bindings. A Book of Beginnings is one of my favorites. When I reached the biographies, I had to chuckle, because on one hand there was The Lives of Twelve Good Men and directly opposite it across the aisle was Twelve Bad Men. I was also struck by the great sense of the present the authors of these books had. Mostly published in the 19th century, these books had grand titles such as The Papacy in the Modern Age, or The Age We Live In (Vols 1 and 2), and so on and so forth. Histories of the 19th century published with yet 20 years to go! Now that we’ve passed the 2000 mark, I wonder if we have a different view of how to title things: date specific, and more aware that in ten, if not less, years this history book will be out of date and need to be rewritten. A longer eye toward the future, perhaps, without drifting into science-fiction; 1984 has come and gone, and 2000 is nearly a decade ago. Also, I would say that if anyone wants to understand Western civilization, they have got to read the Bible, just out of sheer volume of commentaries and books written about it. Just think of how many people over the past 2000 years have been writing about the Bible—longer, if we are to include Jewish scholars! For the Essential Western Reader, I would also include the works of Homer, Virgil’s Aeneid, Dante’s Divine Comedy, Chaucer’s Canterbury Tales (perhaps I’m biased), Shakespeare, and Milton’s Paradise Lost. After the 17th-century my perception of What Is Important to Western Civilization/Literature is a little fuzzy, but those works are a good start.